Advertise your ebooks on BookSends, and get them right to the readers who want them! We've got over 120,000 active readers on our lists. Check below for subscriber stats and prices. Let us know about your upcoming deal, but know we’ll only be accepting the best deals on top-quality books. We look forward to working with you! They’re advertising with us. Are you? *Due to limited space, authors are asked to submit just 1 book at a time and are limited to one ad per 30 days. We will not feature the same book more than once every 90 days. 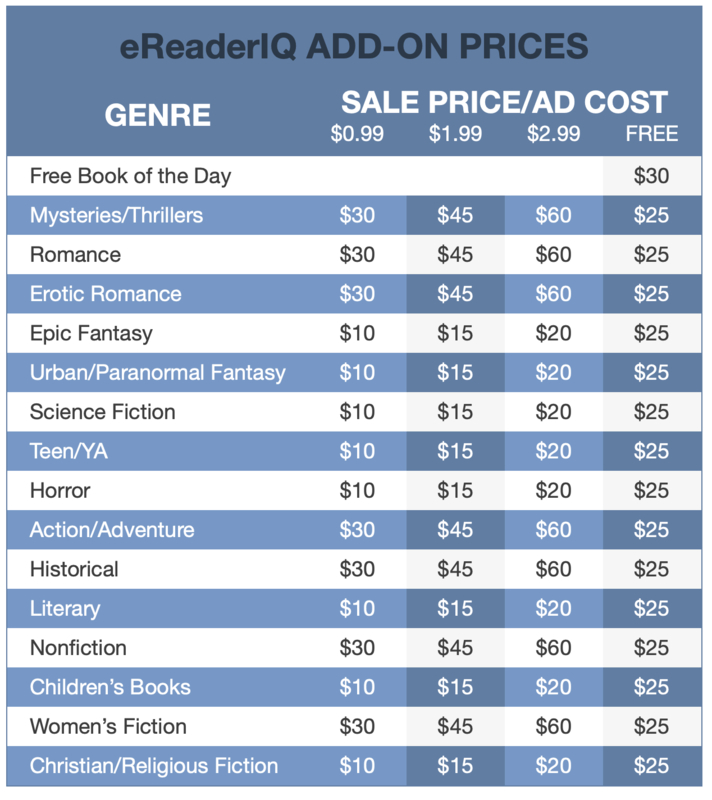 *If a book has been free in the previous 90 days, that's the only price we're willing to feature it at. Authors can now use their affiliate links with free book promotions at no extra charge! Sale price must be valid on Amazon’s US site. You can enter any additional information about your sale price in the comments field below. Please enter only your book's 10-digit ASIN. If you don't have an ASIN, check the box below. Which Genre List Would You Like to Reach? Please choose a date at least 3 days and no later than 30 days from now. Get featured in the EreaderIQ Daily Newsletter and put your book in front of up to 50,000 more subscribers! Get featured in the BookRunes Daily Newsletter and expand your reach further—up to 100,000 more subscribers! Add a Post to Our Facebook Page? Not sure what your ID is? You can find it on this page. It will be a series of letters/symbols followed by "-20". We are now also offering you the option of using your tracking ID on a second book, one of our Free Books of the Day, for an additional $35. If you would like to add this option, check the box below. We are now giving ALL authors the option to use an Amazon Affiliate Program tracking ID. Even if your book is not free, we will include your ID on one of our Free Books of the Day for an additional $35. If you would like to take advantage of this option, check the box below and include your tracking ID in the following field. By clicking SUBMIT, I understand that my book must be properly discounted in order to utilize the ad space I have paid for.